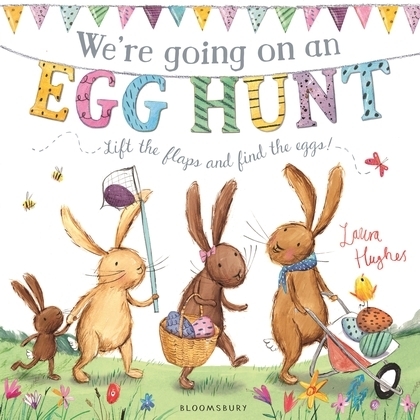 We're Going on an Egg Hunt is a children's picture book written by Bloomsbury Children's Books and illustrated by Laura Hughes. It is 24 pages long and was published in 2016 by Bloomsbury Children's Books. It retails for between $12.99 and $14.99 and features full-colour illustrations and flaps to lift. We're Going on an Egg Hunt is based off the children's nursery rhyme 'We're Going on a Lion Hunt' and pays tribute to Michael Rosen and Helen Oxenbury's children's book We're Going on a Bear Hunt. We're Going on an Egg Hunt is a companion book to We're Going on an Elf Chase, which was written by Martha Mumford and illustrated by Laura Hughes and published by Bloomsbury Children's Books in November 2018. We're Going on an Egg Hunt would make a wonderful gift to give to a child to Easter. The book features colourful and energetic illustrations that pop off the pages. Laura Hughes uses ink and gouache paint and crayons to make her illustrations and the results are just delightful. There are flaps on each page that children can lift and multiple hidden eggs to find creating an interactive reading experience for both kids and adults. The book is a joy to read with simple rhymes that will get a smile out of anyone who has ever read We're Going on a Bear Hunt. If you are looking for a good book to read to the kids this Easter I would recommend this book.